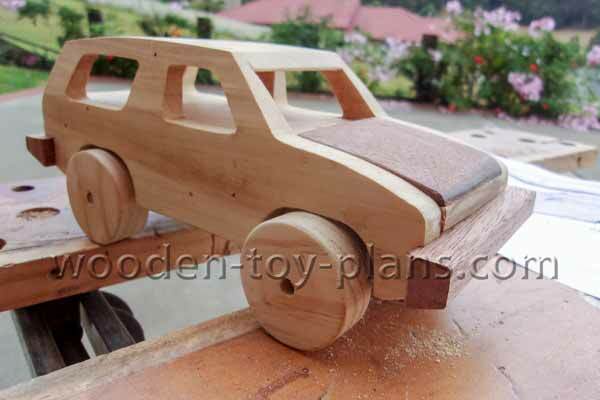 How to build a simple wood toy car. 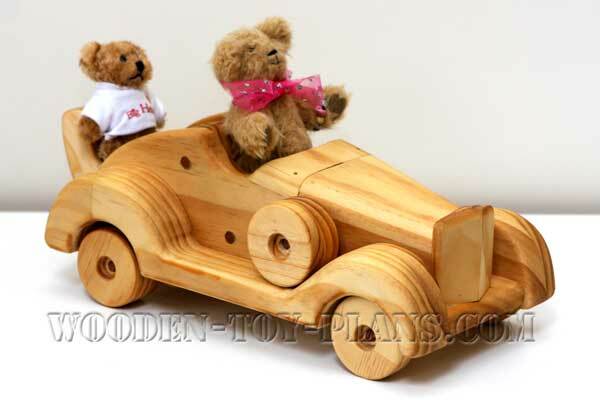 With the increasing popularity of 4-wheel drive off-road vehicles, it was only a matter of time before we came out with our “wood” version. The scale of this toy is fairly accurate, so the finished product looks very much like a real 4 x 4. In fact, you may be a bit reluctant to hand this fine looking toy over to junior. Don’t worry though, it’s built tough and will take punishment, just like the genuine article. We built our 4 x 4 using cherry and walnut, but most any wood will do. 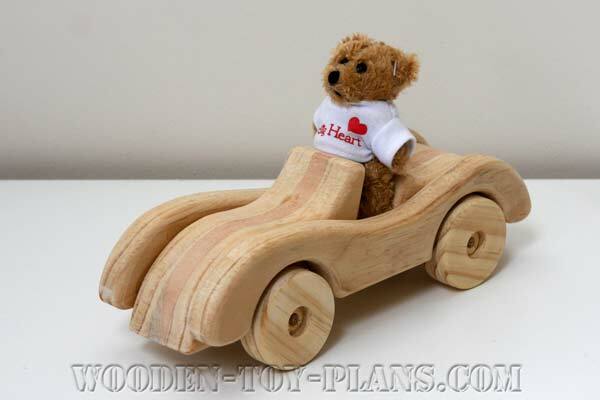 It is best to select a dark wood for the blocks (A and B), as this will lend the wheel wells and grill an authentic look. Cut the stock for part A about 8-1/2” long to accommodate the notches to accept the bumpers later on. Cut part B to size. Cut out the stock for the hood ©, top (D), sides (E), bumpers (F and G), and the axle blocks (H). Note: cut these parts square since you will be shaping after assembly. Use the dado head to cut the notch in part B to accept the hood. Use the dado head to cut the axle grooves in parts H.
Chamfer the axle block edges as shown. Hot glue together the two 1/2” thick side pieces temporarily. Transfer the illustrated grid pattern pattern to the sides. Use a saber or jig saw to cut both pieces at the same time. Drill a starter hole to begin making the window cut-outs. Use the jig or saber saw to cut out the windows. Cut the profiles for the bumper notches. Glue the two blocks (A and B) together. Add the sides, positioning them so the upper block protrudes 1/8” at the front, giving the appearance of a grill. Glue the hood and top in place. Sand to shape as shown. Use a plane to bevel the sides and the top. Use the table saw dado head to cut the back bumper notch to 3/8” wide and the front bumper bumper notch to 1/4” wide. Glue both bumpers in place and flush their lower edges to continue the angled undercarriage profile, front and rear. Add the axle blocks and mount the wheels and axles. NOTE: since there is little clearance on either side of the wheel wells, axle block position is important, and you must watch out for slippage along the axle block glue lines. Sand the 4 x 4 thoroughly, breaking all sharp edges. 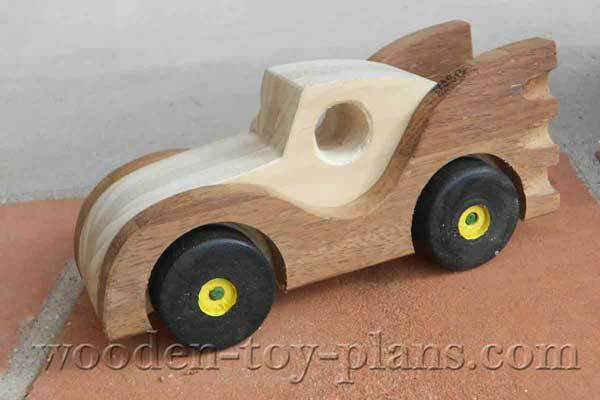 Visit the wooden toy car designs page to download printable full size template patterns.